Bubblr - Students can create free comic strips using flickr creative commons images. They simply search under tag and they're offered a wide array of photos to choose from that all meet fair use standards! This web 2.0 tool is great for the classroom because it's simple to navigate and easy for young children to publish their own unique story. 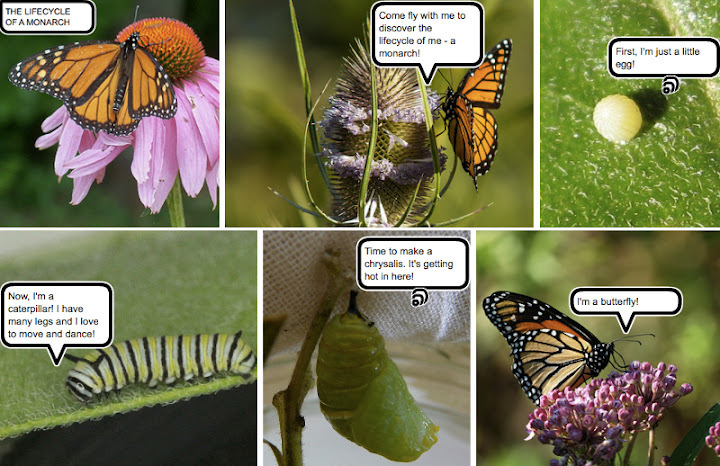 You can use bubblr to create science comic strips, such as: the lifecycle of a butterfly or frog, the journey of a raindrop, or the transformations of matter. Furthermore, students can just have fun with the tool, creating funny, fictional stories. What child doesn't like comics?! It asks for a user name but I can't find a member or join button?! No need to join, type what you want to search for in the "tag" box (ex: butterfly) and hit "go." The user box is to search for a particular user on flickr. If you have images on flickr, you can type in your flickr user name and add your own photos to your comic strip.